Brendan Burchard has had enormous success as a self-made business coach and speaker and is clearly well tuned to the needs of an audience who will pay 1000s of dollars to attend his presentations. I have read his work for many years and followed some of his courses. And therein lies the problem with this book. He expects his readers to just sit back and be fed what they already have heard a hundred times before and pay for the privilege. Not all of us find endless lectures and sermons from a pontification position useful. In fact most of us find them of little value and actually very tedious. I dislike being preached at and this is precisely what Brendon specialises in. He is a marketing man and knows how to use the emotional trigger words ad naseum. But it is too easy to go on, and on, and on about banal detail and not deliver practical suggestions. The Manifesto is not a manifesto. It is a summary of problem areas about life. it does not ask questions but expands on very general points which add little value on what it basically common sense. The structure feels like an artificial construct to fill pages which had me skipping forward to try and find something useful. There is nothing new here and the content could easily have been condensed into 60 useful pages without loosing anything. And please, publishers, change the font. I read this book on a MacBook and the font is so horrible it put me off reading even before I started. Overall I was very much looking forward to reading something of value here and was very disappointed. Disclaimer. I obtained this copy through Netagalley. 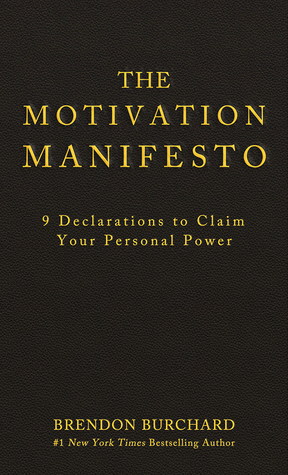 Sign into Goodreads to see if any of your friends have read The Motivation Manifesto. I recently purchased this book through Kindle expecting some practical advice to be contained within it. Unfortunately I had to agree with this reviewer. The book could easily be condensed into a few pages of practical advice rather than a bullet list of problems, with no solutions. There might be a few gems in the text but they're buried under so much fluff. I think a reader I better off reading blog posts from zenhabits or the minimalist. They offer similar advice but in the much denser package without all the baggage.